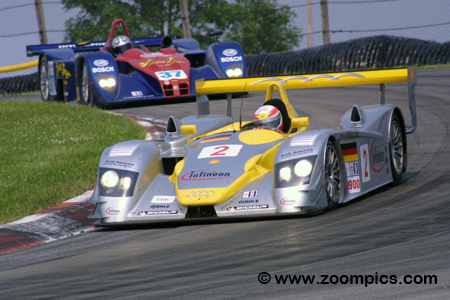 2002 was the fourth season for the American Le Mans Series (ALMS). The rules for the series followed those of the legendary 24 Hour of Le Mans which meant there were four classes. Le Mans Prototype 900 (LMP900) – These were the purpose built race cars powered by a 6.0-litre normally aspirated or 4.0-litre turbocharged engine. The cars could weigh no less than 900-kilograms. Audi, BMW and Cadillac entered two factory supported cars. 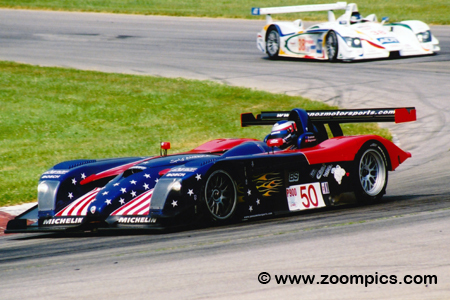 Privateer teams entered cars manufactured by Riley & Scott, Lola and Panoz. Le Mans Prototype 675 (LMP675) – Introduced in 2001 was the LMP675 class for cars which could weigh no less than 675-kilograms. The rules were for the cars were written so that the two LMP classes (LMP900 and LMP675) would be contending for the overall win. Grand Touring Sport (GTS) – This class included production-based cars such as the Dodge Viper GTS-R, Chevrolet Corvette C5-R, Saleen S7-R and Porsche 911 Turbo. The cars were permitted to use 8.0-litre normally aspirated or 4.0-litre turbocharged engines. These cars could weigh no less than 1,100-kilograms. Grand Touring (GT) – The GT cars were also restricted to an 1,100-kilogram weight rule and had similar engine limitations as the GTS class. These were also production-based cars such as the BMW M3, Porsche GT3RS and Chevrolet Corvette C5-R. Unlike the GTS entries, competitors in this category could not use carbon fiber brakes. 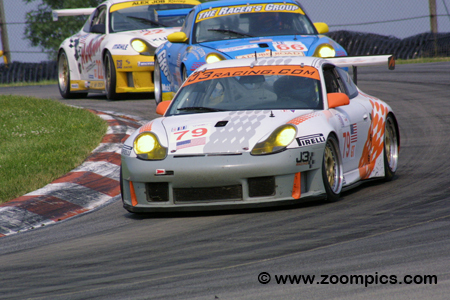 The ALMS schedule included ten North American events in 2002. The opening round was the 12 Hours of Sebring. It was followed Sonoma, Mid-Ohio, Elkhart Lake and the inaugural National Grand Prix at Washington, D.C. After these weekends the championship headed to Canada with a stop at Trois-Rivieres and Mosport. The teams then travel west in September to compete at Mazda Raceway Laguna Seca. The penultimate round will take place at the new Miami street circuit and the finale will be Petit Le Mans at Road Atlanta. 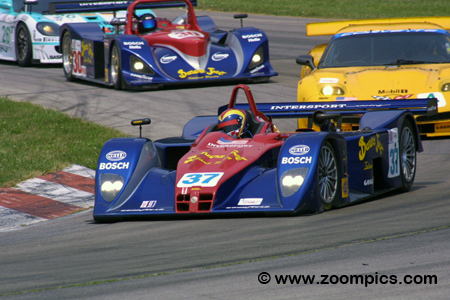 The Grand Prix of Mid-Ohio was round three of the 2002 American Le Mans Series. Thirty teams would compete on the thirteen-turn 2.258-mile road course for two-hours, forty-five minutes. 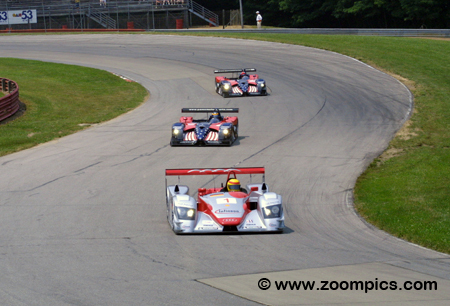 The first lap into Mid-Ohio Sports Car Course’s ‘Esses’ for the top qualifiers. Leading the thirty starters is the pole-winning Audi R8 shared by Frank Biela and Emanuele Pirro. Biela is followed by the second and third fastest qualifiers from Panoz Motor Sports. Sharing the No. 50 Panoz LMP01 are last year’s winners, David Brabham and Jan Magnussen. 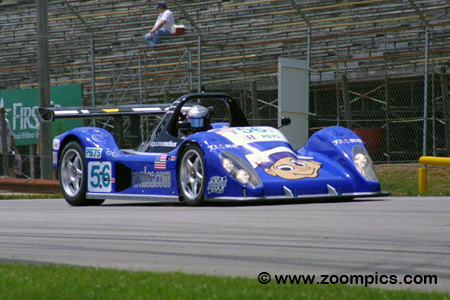 The second Panoz is driven by Bryan Herta and Bill Auberlen. After two races the No. 1 Audi R8 did not have a podium finish to show for their efforts. 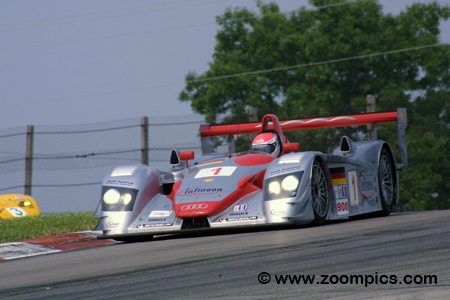 At Mid-Ohio, Frank Biela and Emanuele Pirro started on the pole and won. However, it wasn’t as easy as it sounds. Late in the contest, Pirro trailed his teammate, Tom Kristensen and battled with the Panoz of Jan Magnussen. Pirro got the ‘upper hand’ on Magnussen and Kristensen ran out of fuel on the last lap giving Biela and Pirro the victory. There were six entries in the GTS category and the favourites to capture the class victory would come from Corvette Racing. Sharing the No. 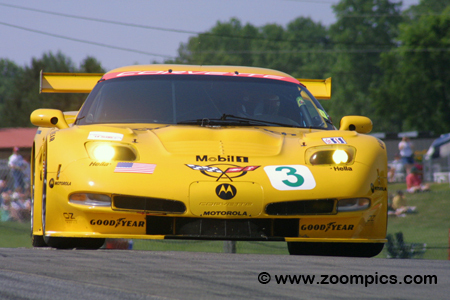 3 Chevrolet Corvette C5.R was Ron Fellows and Johnny O’Connell. The pair was the points leaders having scored wins at Sebring and Sonoma. Starting from the pole, they battled with their teammates, Pilgrim and Collins and despite a fuel pressure issue, the pair captured the victory. The Mid-Ohio Sports Car Course witnessed a number of firsts for Team Bucknum Racing. Sharing the No. 56 Pilbeam MP84 were Jeff Bucknum, Chris McMurry and Bryan Willman. The Pilbeam started second in LMP675 but, when the Intersport and Archangel teams encountered problems, they inherited the top spot and went on for the win. This was the first ALMS victory for the team, the Pilbeam MP84 and for the drivers. The Racer’s Group and team owner/driver, Kevin Buckler were having a great season. They won the Daytona 24-Hours and were victorious at the Le Mans 24-Hours. 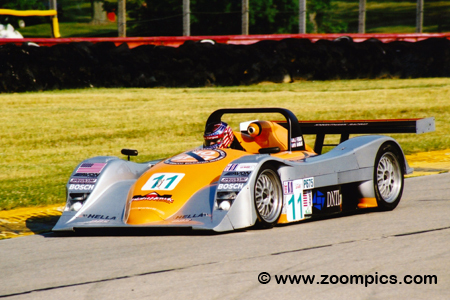 At Mid-Ohio, Buckler was joined by local racer, B.J. Zacharias. Buckler started the race sixth in class but ended his stint in fourth. With the demise of the race leaders, Zacharias moved up the race order and grabbed first place and the victory when the J3 Racing entry slowed. 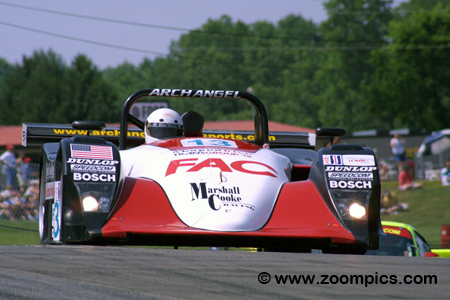 Archangel Motorsports made their ALMS debut in 2002. 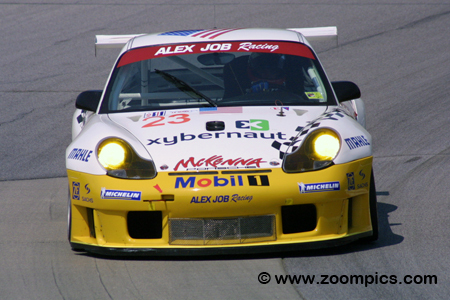 The team entered the series with two consecutive Rolex Grand-Am SRPII titles. In their first outing at Sonoma, drivers Ben Devlin and Dave McEntee took the LMP675 win. Sharing the Lola this weekend were Devlin and Bret Arsenault. 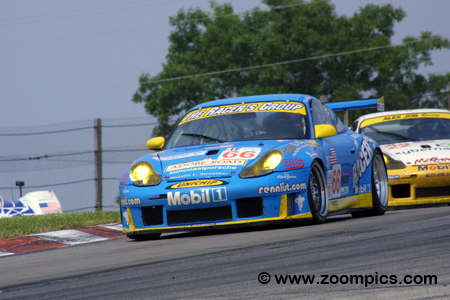 With the retirement of Intersport Racing it appeared that the pair may score another victory – but Arsenault went off course, they finished second. 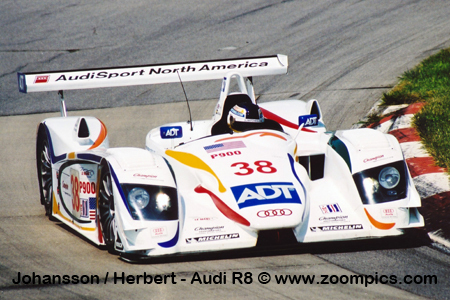 Audi Sport North America’s second R8 was driven by Rinaldo Capello and Tom Kristensen. At Mid-Ohio, they were slightly off the pace and qualified fifth overall. During the race, the pair moved into contention for the victory. The team decided to gamble; as a result, they were the only car not to make an additional stop for fuel. It looked like they might pull it off but on the last lap Kristensen race out of fuel and finished second. The second Corvette Racing entry was shared by Andy Pilgrim and Kelly Collins. The pair started the season at Sebring with a fourth in class but took the runner-up position at Sonoma. The Chevrolet Corvette C5.R was gridded thirteenth overall and second in GTS for round three. The duo chased their teammates, Fellows and O’Connell but their progress was hampered when Pilgrim was hit be a slower LMP car, they finished second in class. The Lola EX257 was proving to be the class of the LMP675 grid. Drivers, Jon Field, Duncan Dayton and Mike Durand, won the category at Sebring by a fifty-two-lap margin and finished seventh overall. Sharing the Lola at Mid-Ohio was the team owner, Jon Field and his son, Clint. They started on the class pole but for all intents and purposes, their race came to an end when they stopped for ten-laps to have a faulty alternator replaced. Timo Bernhard and Jorg Bergmeister shared the No. 22 Alex Job Racing prepared Porsche GT3RS. Bernhard qualified the car and was the third fastest Grand Touring competitor – beaten by his teammate, Sasha Maassen and the Peterson Motorsport entry. During the race, the pair benefited from the contact between the class leaders, Sasha Maassen and Randy Pobst to move up the race order – they finished second in GT. Heading into round three Panoz drivers, David Brabham and Jan Magnussen had reason to be optimistic. The pair was the defending race winners and was coming off a victory at Infineon Raceway. Brabham was gridded on the outside of the front row for the start. The two drivers challenged the Audis and during the final stint, Magnussen fought with the second place Audi but damage relegated him to a third-place finish. The No. 23 Alex Job Racing Porsche GT3RS was driven by Lucas Luhr and Sasha Maassen. Luhr and Maassen were on a winning streak having secured victories at Sebring and Sonoma. The Grand Touring points leaders started on the class pole thanks to Maassen’s efforts. During the race, Luhr found himself battling for the lead with the Peterson Motorsports entry driven by Randy Pobst. Contact on lap-77 eliminated both cars from the race. KnightHawk Racing started the season with a new Lola EX257. Unfortunately, the car was badly damaged when it caught fire at the 24-Hours of Le Mans. At Mid-Ohio, the team entered last year’s Lola B2K/40 which finished second in the championship and earned class titles for Avon tires and Lola. Sharing the car this weekend were Steve Knight and Ohio native, John Fergus. The pair started fourth in LMP675 and finished third. The J3 Racing entry was driven by Justin Jackson and Mike Fitzgerald. The duo shared the No. 79 Porsche GT3RS. Fitzgerald was fourth quickest in the GT qualifying session. Contact between the leaders, Randy Pobst and Lucas Luhr, during the race, allowed Fitzgerald to inherit the lead. A hot day and poor air flow in the car caused him to slow down and lose positions to B.J. Zacharias and Jorg Bergmeister – the team finished third.